^ signing the EITC expansion : will there be consensus on the NEXT economic reforms ? Economic reform of Massachusetts began about three weeks ago, as the Governor signed a new law expanding the Earned Income Tax Credit (EITC) by 50 percent. State Senators, state Representatives, and progressive activists joined the Governor and Lieitenant Governor at the signing — the very icon of consensus. No one cared to mention that a significant number of Senators had wanted to pay for EITC expansion by not lowering the state income tax to 5 percent from 5.15 percent, as by law it will change. The Senate did move away from that proposal; instead, EITC expansion is being paid or by not implementing a scheduled corporate tax break. The House, led by a more conservative financial voice, had already enacted that EITC plan. And so the State had its progressive consensus moment. Less than month later, however, there are at least two plans afoot in the senate to increase taxes. Both should be rejected. First is a proposal to create a two tier tax assessemnt. Those with incomes over one million dollars annually will pay 9 percent tax. Everybody else will pay the new 5 percent rate. The second proposal — just released this week — will create a $ 250 college savings account fotr every baby born in Massachusetts, half to be apid fpor by taxpayers. The cost : $ 18 million annually. Progressive State Senators adduce these proposals because the state probably does need additional evenue if it’s to pay for massive transportation upgrades and service expansion, pre-kindergarten education, and the new Opioid addiction crisis terams. Taxing to obtain that money, however, doesn’t seem a wise choice. In our view, instead of penalizing those who earn a lot — and who spend most of it into the economy, boosting businesses and thereby creating jobs — it’s far better to raise the state’s minimum wage, or to approve home rule petitiions raising the minimum wage in our big cities. Bernie Sanders likes to point out that if the 1968 Federal minimum wage had kept pace with inflation, it would now be $ 26 an hour. Imagine the economic boost if every full time worker had that kind of income to spend on stuff and services ! We don’t advocate raising the minimum wage that high — yet — but we do think it smart to boost the state’s minimum to $ 15 an hour and index it to inflation. Workers earning $ 600 a week — or more — and thus $ 31,200 a year would rise above the level of EITC credits; they’d actually pay taxes instead of receiving credit payments rom the state. They’d also have funds to spend into the discretionary economy. A two-worker family earning the current minimum wage and, let us say, ten percent above it, $ 9.90 an hour, can barely afford necessities. At $ 792 a week, that family, if living in Boston, pays at least 50 percent of its total income rent. Even in New Bedford or Worcester, they’d pay one quarter of their income for rent only, never mind utiiities, cell phone, cable TV, clothes, food, and insurance. Raise that two worker family’s income to $ 1200 a week, now, and they’re paying one-third of their earnings for rent even in Boston and can afford to eat out occasionally, buy furniture, send the kids to summer camp, take in an entertainment event, maybe even save some money to buy at least a condominium. And pay taxes. To us, that makes sense. We likewise do not see the purpose in asking taxpayers to pay half of the proposed college savings accounts. State Treasurer Deb Goldberg proposes that such collgege savings accounts be funded entirely from private sources. Why not do this ? And if we can raise the state’;s minimum wage to $ 15 an hour, why not give families the option to designate a portion of their state tax payment to such fund ? Economic growth for all seems to us far more progressive than tax penalties for a few. One last note. 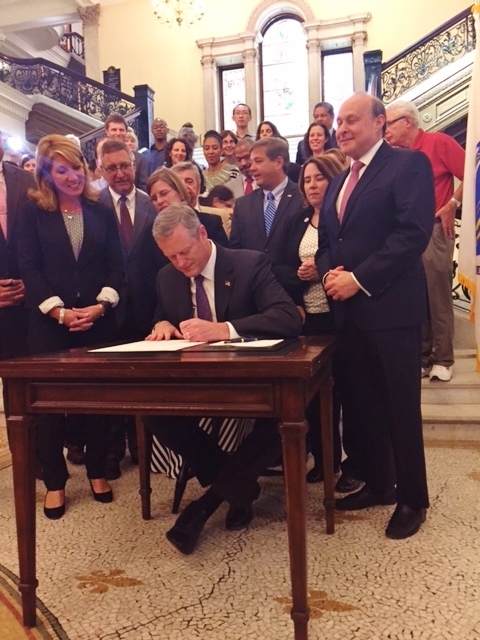 At the EITC signing, Governor Baker said, “this is just the first part. i can’t wait to come back for the second part !” I wonder what he has in mind.